You may have created awesome content but are you getting it in front of the right people? One of the challenges in creating awesome content is the often neglected activity of actually marketing your posts. It’s not called content or inbound marketing by chance; there are a ton of marketing activities that help in the discovery and sharing of useful and creative content. In this post, we’re going to focus on two crucial ingredients in the marketing mix: learning how to optimize your blog posts for SEO and social sharing. Crafting a good title is an art form that every marketer needs to learn. The goal is to end up with attention-grabbing headlines that make people want to learn more. At the same time, you want to think about online discovery in a way that the search engines will love. While there is a huge movement towards conversational search, more traditional keyword research is still important. Start by doing a bit of research to determine the search terms folks are using to find the information you have crafted. In the case below, “real estate marketing” is my focus keyword phrase. Once you settle on the keywords, it’s important to try to use the keyword at the beginning of the title. That tells the search engines what to expect. The permalink can be a variation of the title, optimizing for another search term with the same basic keywords, or it can be the title without the prepositions (in, at, but, of, a, etc.). For example: /real-estate-marketing-seo-keyword-research. Internal linking helps you to indicate to search engines which pages are the important priority, as well as which pages are related to one another. Those signals are super helpful to Google, Bing and Yahoo in ascribing meaning and value to your pages. 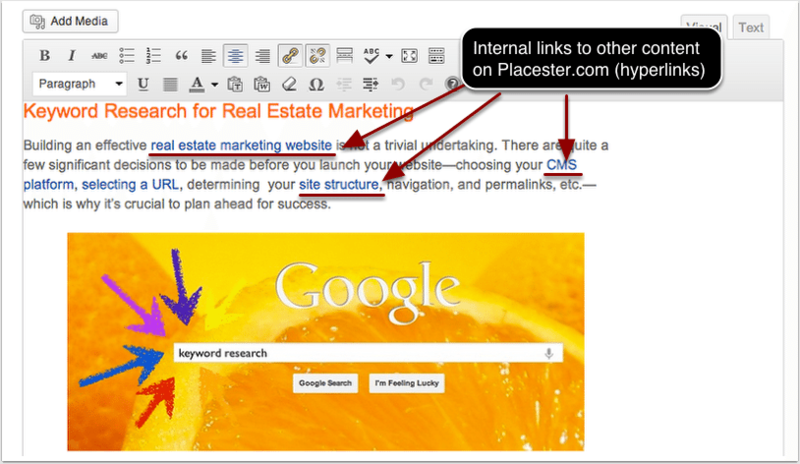 Think about the internal links as providing additional information to the user who is reading the page; it allows the reader to dive deeper into your site. The more time a visitor spends on your site, the more you get to build trust with them. It’s a win-win situation. Once you select the text you would like to turn into a hyperlink, click the link symbol in the WYSIWYG editor, search for a term that fits the article and the selected copy. 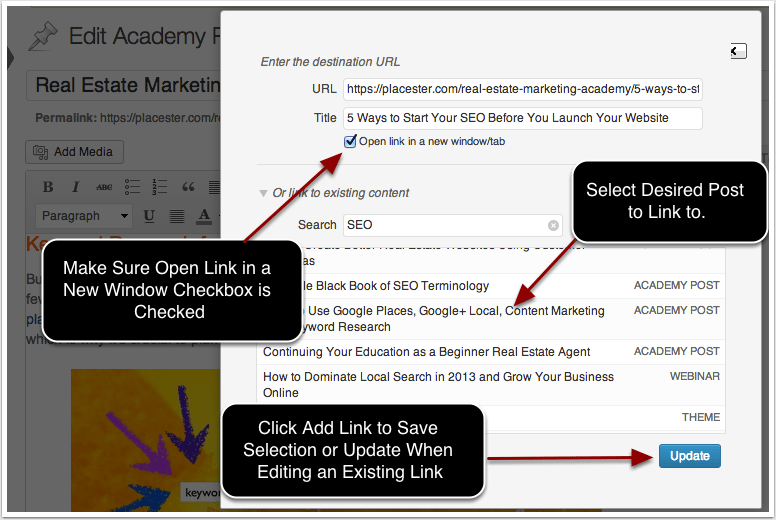 Select the post and click the “add link” button to save. 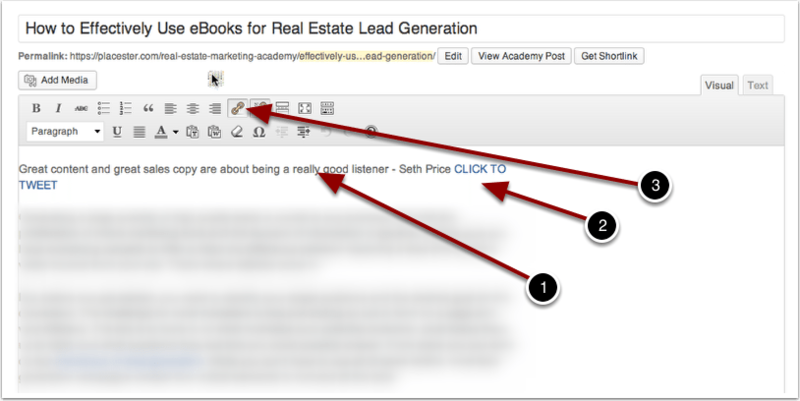 Click to Tweet is a simple call to action that you can add to your posts to make it easier for readers to share. It’s a little extra work on the front end, but it will pay off in the long run by helping your visitors amplify the killer content that you’ve put together. I tend to use inspirational quotes or stats relating to the post I’ve written. Experiment and track the results. 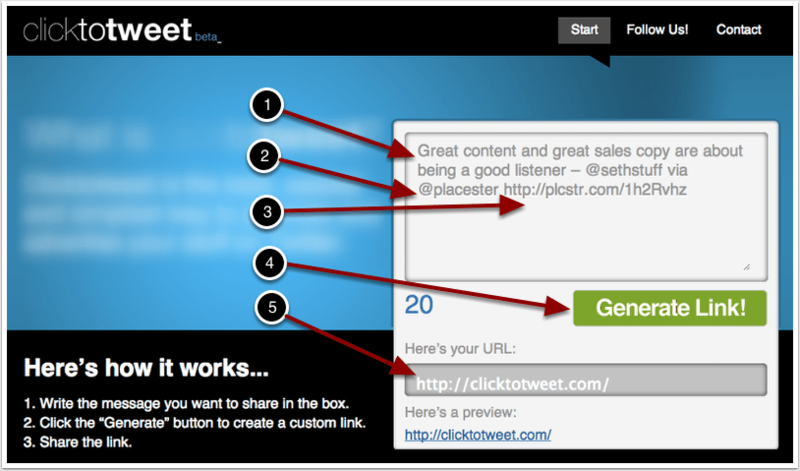 Paste article URL into bit.ly short link generator, then paste into CTT. Copy link and bit.ly again. Add quote to post in visual editor. Add text “CLICK TO TWEET” in all caps. Select “CLICK TO TWEET and add bit.ly’d CLICK TO TWEET URL link. If you’re using WordPress, get a good SEO plug-in. We like WordPress SEO by Yoast. 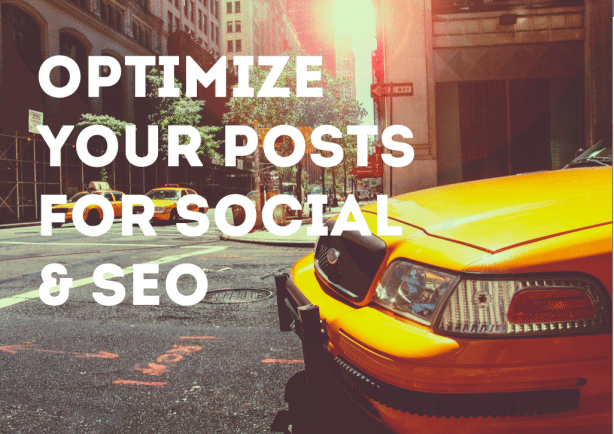 Start by navigating to the bottom of post and locate the the SEO plug-in section. Enter the focus keyword for your post. Confirm that you have used this keyword in the heading, title, URL, content, and meta description. 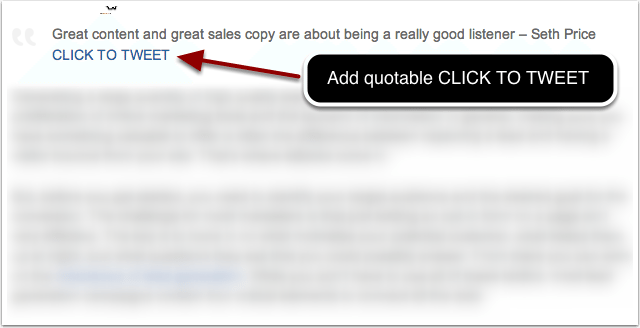 Write a compelling SEO title. This does not have to be the same as the article title. Think of it as a mini call to action when this is discovered via search. Craft a meta description. Ask a question, then tell them what to expect. You should also check out The Sales Lion’s great post on this subject. If you follow the steps above, you’ll be head and shoulders above most folks posting content on the Web. Create the best content you can and do everything possible to get it in front of the right people. Remember: It’s not about volume. It’s about being indispensable to your audience. I’d love to hear about your personal experiences when it comes to blogging, finding readership, and generating sales. What works best for you? You can comment below, send me an email or find me on Twitter: @sethstuff.